Make a list. WorldCat’s in town. WorldCat has been doing lots of great things lately to allow it’s users (that’s us, library people) to use their data. The WorldCat API is a great thing to investigate because it gives you lots of control over the bibliographic data that gets displayed. It also takes some time and programming skills to make good use of it though. For those looking for a simpler solution, WorldCat has a few simple Widgets that can easily be embedded in a web page. In this post, we’ll look at WorldCat’s list widget as a way to quickly and easily display a collection of books (and possibly other materials) on a web page. First things first. You need a WorldCat account. You already have one, right? If not, create one here (and shame on you!). Decide what you want to make a list of. Search for things related to that topic. 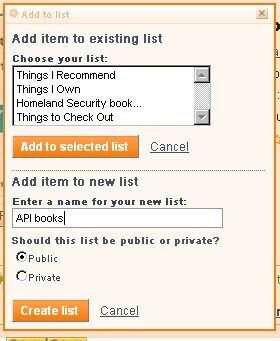 (I’m going to make a list of books about APIs). Click to view the record for an item you want to add to your list. Above the item title, you’ll notice a small link that says “Add to list”. Click it. If you’re creating a new list, you’ll have to repeat steps 4 and 5 and choose the list you’ve just created. Select a list or create a new list to put your item in. If you’re successful, you’ll see a confirmation message at the top of the screen. You'll see this message if your item has been added successfully. Repeat steps 2 through 6 until you have added everything you want. 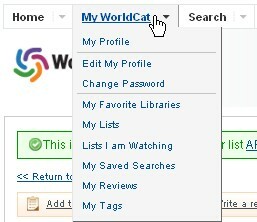 Choose 'My Lists' from the 'My WorldCat' menu to see your lists and get your list id. Now you’re ready to turn your list into a widget! You need one important piece of information about your list before we can do this though: the list id. Okay. Now we’re ready to finally make our widget. Start by heading to the widgets section of worldcat.org. Copy and paste the provided code into your web page using your favorite HTML editor. Replace the part of the code that says **listId** with your list’s ID. Any additional items you decide to add to your list will automatically (magically?) show up in your WorldCat List widget. Use it to add some dynamic content and interactivity to your research guides, post it on your personal site to let people know what you’re reading, or help a faculty member create a list of suggested readings for a course. If you’re lucky enough to have WorldCat Local at your institution, you can insert this information and direct users to your WorldCat Local implementation rather than the general WorldCat.org. You’ll need to add this to the URL in the <script> tag. For instance, at Towson, our WorldCat Local URL is http://www.towsonuniversity.worldcat.org. So, in my URL, I need to add &myLocal=towsonuniversity. 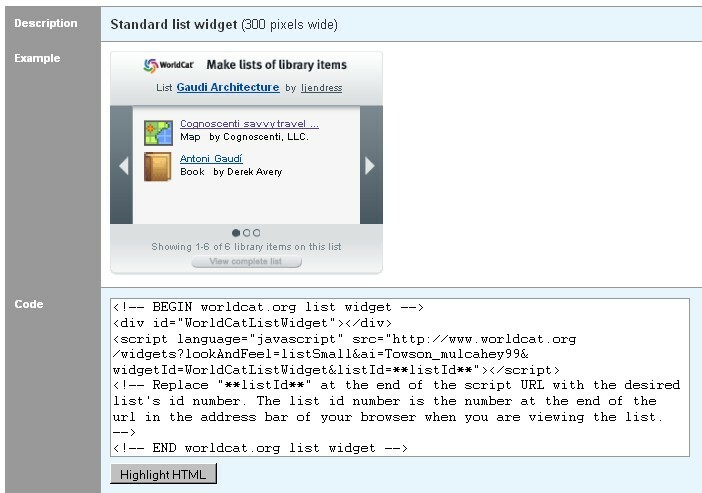 This is a great walk-through of how to make a list and then implement it in the WorldCat list widget! Thanks David, I couldn’t have said it better myself. Would you mind if we did a quick recap on the WorldCat blog and pointed people over to your post? Absolutely! I don’t mind at all. Thanks, Alice.